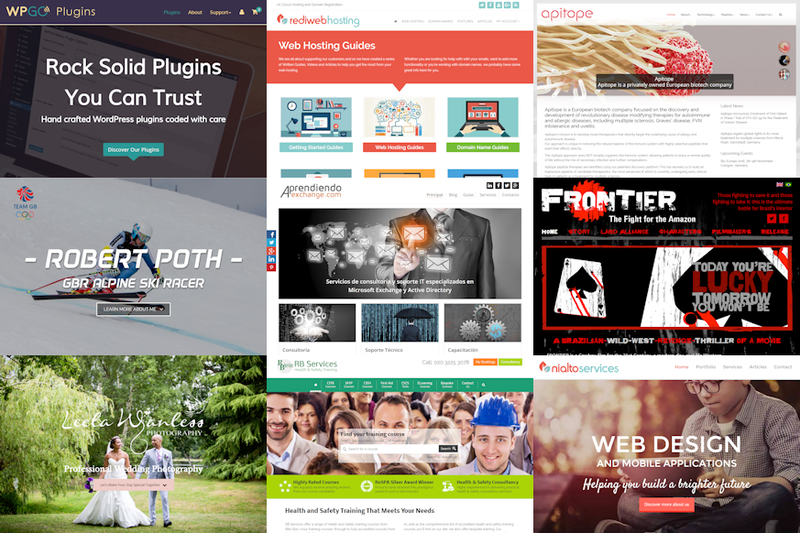 Note: Header templates are not available in Minn.
By the way, this feature is exclusive to WPGO Themes. You won’t find it anywhere else! 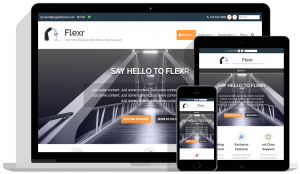 Open the customiser and navigate to Flexr Theme Settings > Header Templates. Simply select a header template from the drop down. Once the header template has been selected the thumbnail image changes to represent the currently selected header template. Each templates has a fixed number of menu locations and widget areas. For each widget area in the header template (that you wish to display widgets in) simply make a selection from the drop down box. If you leave a widget area set to ‘none’ then nothing will be displayed for that location. Do the same for menu locations. For each menu location in the header template (that you wish to display a menu in) simply make a selection from the drop down box. If you leave a menu location set to ‘none’ then nothing will be displayed for that location. To edit a menu, or widget location, go to Appearance > Menus or Appearance > Widgets. 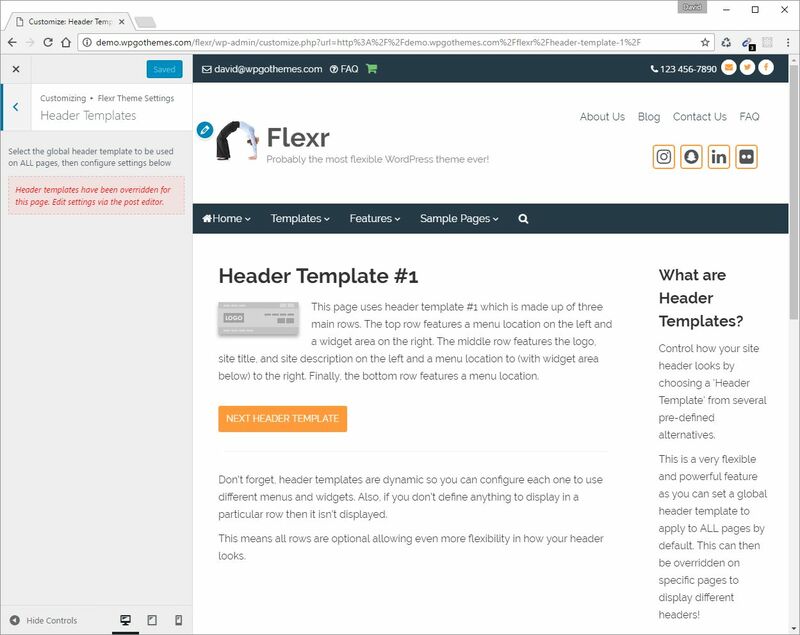 The header templates will automatically update once you’ve finished editing. Important! Only custom widget areas and menu locations of type ‘Header’ will show in the drop down boxes. If you haven’t defined any yet then only the ‘none’ option will be available. Let’s fix that now. To create one or more custom header widget areas that will appear in header template drop down boxes go to Appearance > Widgets and look to the right of the screen. If you need to delete a custom widget area then click the gear icon to the right of the ‘Add Custom Widget Area’ label. You’ll see a drop down box to select a custom widget area to delete. A color code key for the custom widget areas is also displayed. Once you have created your header widget areas add some widgets to them. These will be displayed whenever your custom widget area is selected via header templates in the customiser. 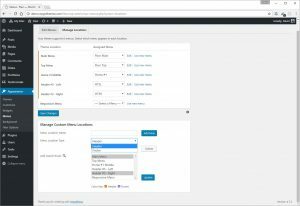 Similar to widget areas you need to create custom header menu locations that will appear in header template drop down boxes. Go to Appearance > Menus and click the ‘Manage Locations’ tab. Then click the gear icon to the right of the ‘Save Changes’ button to make the ‘Manage Custom Menu Locations’ section appear. Add a name for your custom header menu location and select ‘Header’ from the ‘Menu Location Type’ drop down box. Click ‘Add New’ to create your new menu location. Once created it will appear in the list of menu locations at the top of the screen. 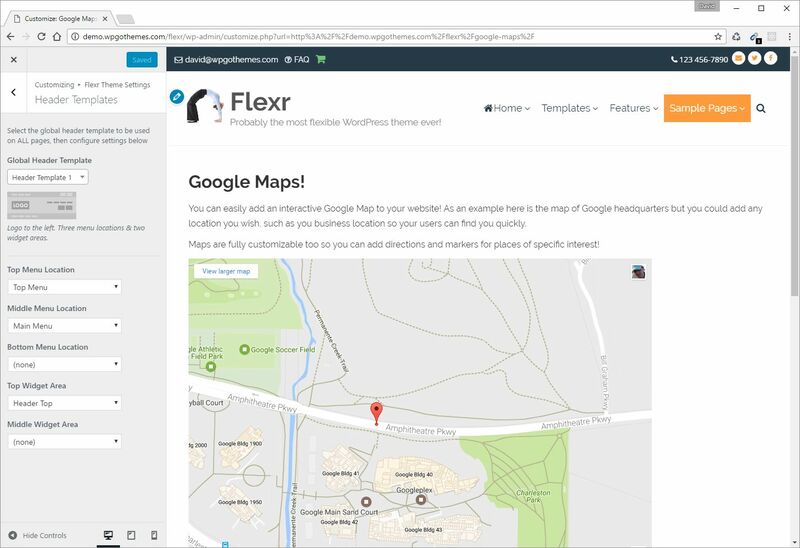 Assign a menu to your new location to make it available in the header templates drop down box. If you need to delete a custom menu location then you can do so via the ‘Manage Custom Menu Locations’ section. That’s pretty much all there is to it. 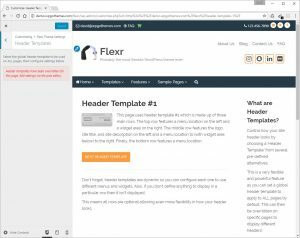 And although it may seem confusing at first it’s really just a case of deciding which header template you want to use for your site header via the customiser and then making sure you define the header menu locations, and widget areas, you want to display. This is a very powerful feature that allows you to override the site header for the current page. 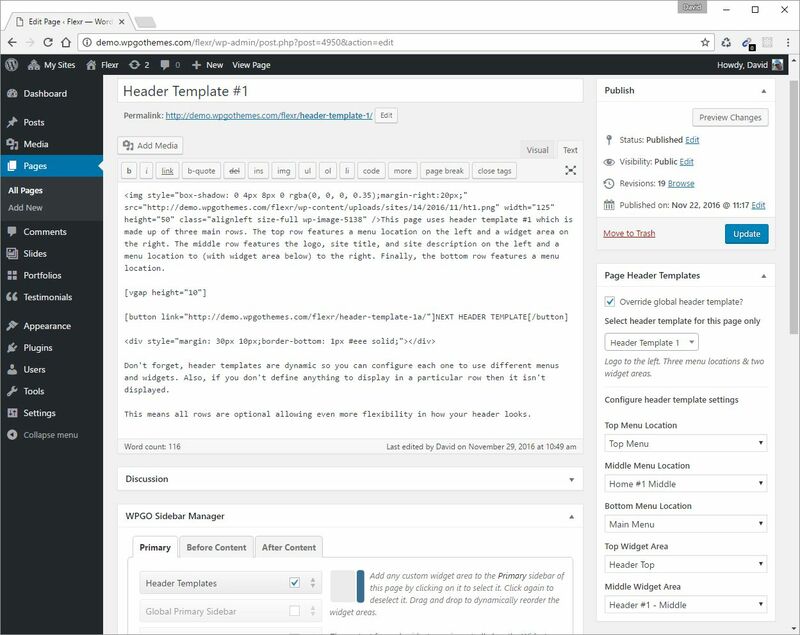 Go to the page editor for the page you want to display a custom header on and look for the ‘Page Header Templates’ meta box. Click the ‘Override global header template?’ checkbox and then make your selections just as you did above in the customiser. When you save the page and view it on the front end it will display the header template you specified on the page editor rather than in the customiser. Pretty neat, huh? 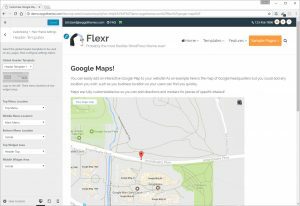 If you view the customiser for this page you’ll see a notice that this particular page is overriding the global header template setting.